Well we have been waiting for our Shaper Origin to arrive we have been banking projects, one of the first ideas was to recess the Floyd Detroit leg. Much like Shaper Origin, Floyd Detroit is a furniture company that is focused on modularity and flexibility in small spaces. The Floyd legs allow users to easily make a table with any flat surface material. One thing that had always bothered us about the Floyd is leg is that it sits proud of the surface when clamped. In this case study we used MDF to perfect the fit, but this method can be used with any material Floyd is capable of holding and Origin is capable of cutting. We began our project by taking a perfectly parallel top-down photo of the Floyd leg. For ease, we clamped the leg to our countertop. We than brought this image into Adobe Illustrator to create the SVG file. Once we made sure the image was straight and paralell, we dropped a transparent pink box over the leg. We than pulled the corners inward to match roundness the Floyd leg. 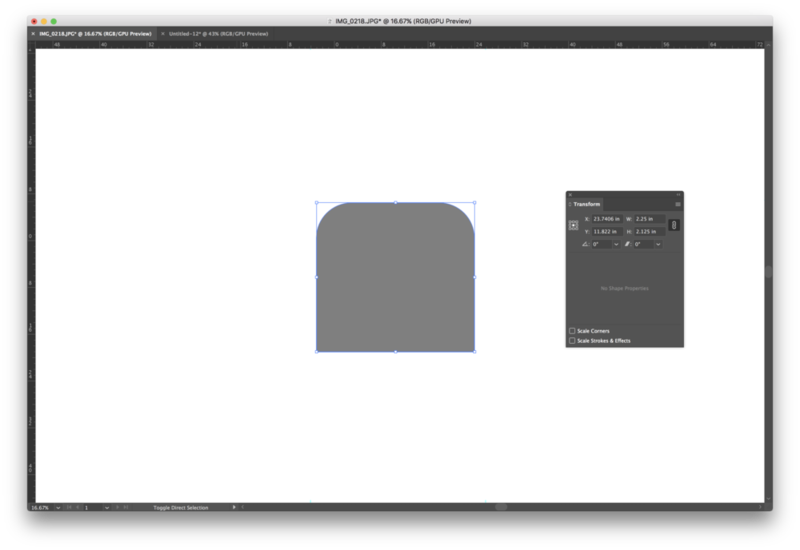 Once the corners matched, the vector needs to be squared off at the bottom. We dropped a rectangle at the bottom and merged the shapes. After we finalized the vector, we took detailed measurements of the Floyd leg and scaled the svg for Origin accordinly. We prepped our work surface and laid out a .125" grid to place the pocket for the Floyd Leg. We used a 1/4" cutter on speed 6. We began with a 1/16th roughing pass. Our final pocket is 1/8th inch deep. After our initial roughing pass, we placed the leg in the pocket to check for fit and we snuck up on our final cut. We used an offset of .001 for a nearly perfect fit. After we were happy with the fit of the leg into the pocket, we did a final pass at 1/8th inch depth. After we finished the placement of the top portion, we flipped the piece to create a hole for the clamp. Depending on your surface, the legs tend to slide slightly, creating a pocket for the clamp, allows it to lock the leg into place.